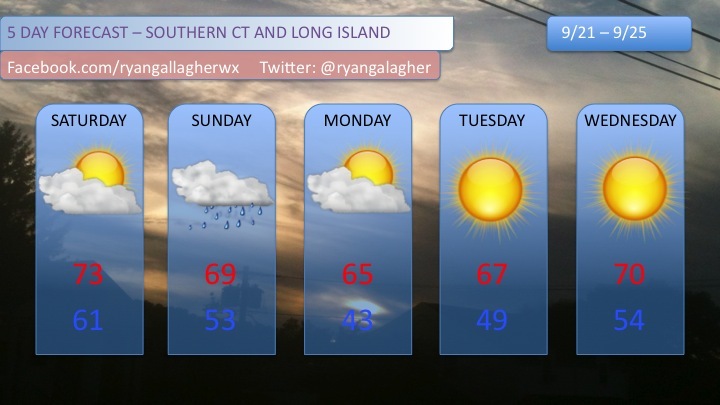 Not a Washout This Weekend, but some showers are expected. Discussion: An upper level shortwave trough in the north central US will traverse New England during the day on Sunday and become cutoff just off the coast of Maine. At the surface, a cold front works its way into the Tri-State on Sunday, and brings with it a chance for showers and maybe some thunder but instability is expected to be marginal at best. After that things dry out for at least the first half of the workweek. Saturday: A sunny start, but clouds will gradually increase in coverage as the day goes on. High temperatures in the low to mid 70’s. This entry was posted in Uncategorized and tagged climate, cold front, new england, weather. Bookmark the permalink.